I’ve answered this question before, and published an article showing how to do the math in 2014. Click here to read that. But before you do that, you may want to read this. The prices in The Guide are for a 24-team mixed league, and are intended to emulate the pricing of a deep AL and NL only leagues. The reason I don’t publish AL and NL only prices—the leagues are a little different, which makes the values of their stats a little different—is because when we put together the Guide in December there are usually hundreds of free agents out there. We don’t know who is going to be in which league. The important thing to remember about deep prices is that the value of the stats, be they homers, RBIs, runs, hits, steals, are linear. That means that every home run a batter hits has the same value. Every stolen base has the same value. Et cetera. The reason for this is because the vast majority of stats that are produced in the whichever league one is playing in are counted in your roto standings. The replacement level is pretty close to nil for any stat category. In a 12-team mixed league, you’re playing with just 12 of baseball’s 30 teams. You’re only using the half the available stats overall, roughly (this varies by category). This means that a player has to hit a bunch of homers before those homers have any value. And if he doesn’t hit them, there will someone available for free who will. What this means, practically, is that in a AL or NL only league, the last player taken costs $1. And in a 12 team mixed league the last player taken cost $1. But the last player taken in the mixed league would have cost about $13 in the only league. The chart below shows the prices for players taken in a 15-team mixed auction, likely Tout Wars in 2016, from most expensive to least. The thing to notice is that the graph goes pretty straight at about the 50th player taken, which supports the observation that after the third round in a mixed draft the players in each round are pretty interchangeable. No matter who someone takes, there’s another player like him still available. But this isn’t so among the best players. 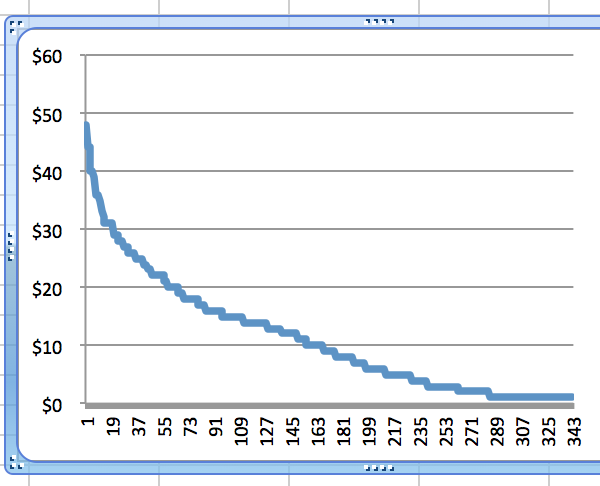 They are not interchangeable, and their value drops quickly, as the left side of the graph shows. When someone takes Mike Trout, there isn’t another Mike Trout out there. There is Jose Altuve, but when he’s gone there isn’t someone similar. By the time you get to the sixth or seventh player the options are not nearly as appealing as the early choices were. In a draft, the compensation is the earlier pick in the next round. In an auction there is no compensation. Those irreplaceable players can only go to the person who pays for them, and that drives their prices up. Hence the steep curve in the graph showing the prices of the best players. This situation is even more extreme in a 12-team league than a 15-team league. 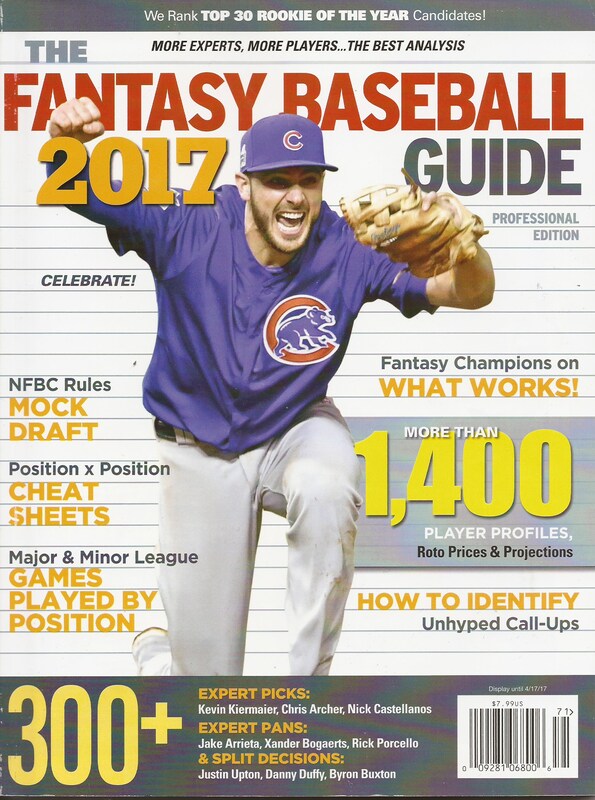 The bottom line is that if you convert the magazine prices to your mixed league size, it is important that you then reallocate money from the least expensive end of the list to the most expensive end, so that you have realistic prices for the Trouts, Turners, and Scherzers in your game. Your draft day goal is to have a list that shows the prices you’re willing to pay for each available player, and have that add up to the amount of money available in your auction. You don’t have to buy those most expensive players. In this year’s Guide, Tout Mixed Auction 2017 winner Jeff Zimmerman talks about how the prices for the top guys in that auction were overinflated. He complains that people always inflate the prices of the top guys in mixed auctions, as if that’s a mistake. I think Jeff is such a numbers guy that he only looks at what people earned to determine their price, and from his success you can see that his price list can work. But I think his list worked in spite of his error, rather than because of it. What makes me think so? The graph above. First off, if you want to read the Mock Draft Commentaries, go here. This is the place where I’ll post corrections and updates to the 2017 Guide. There is a link in the top nav bar, so you can always find it. Page 6: Talking about team names, as we do sometimes, Yoan Moncada and Lucas Giolito were traded from Boston and Washington respectively last winter. While the team changes for both, to the White Sox, made it into their capsules, the wrong team names linger on this page of rookies. Page 6: Very embarrassing. The photo credit is wrong. The picture of Yoan Moncada is by friend and new contributor Buck Davidson. I’m sooo sorry Buck, and will get a fixed PDF for you to use as a clip. Q. It appears to me that Matt Moore’s “Big Price” of $14 is not consistent with his projected stats of 4.44 ERA and 1.35 Whip. I believe his Win and K totals of 11 W and 127 K are very average. I understand he has upside potential, but it appears too me that the $14 projection is not supported by your projections. Please explain. S. It seems to me it would take little effort on your part to include the player’s team either in the “Player’s by Position” section or the Full Profiles. I play in a hybrid NL + 2AL teams (Houston and Texas) and many of us have limited knowledge of other AL players. I understand there will be changes between the start of the season and your publication date, but that’s not near the problem of having no idea of the player’s team (and whether or not he is on one of our teams). Please consider including the team for each player. Dear Reader. The projection in the Guide was the mechanical projection that derived from Moore’s history, and as you note looked rather pessimistic for a player I’m fairly keen on and three other writers made PICKS of this year. I work on the projections all winter and at some point I upgraded Moore to a 3.72 ERA and 1.23 WHIP. It just so happens this projection, also in 150 innings pitched, is worth about $12 and I’ve dropped his bid price to $13. Note that in CBS and LABR, Moore went for $13 and $11, so I was definitely in the ballpark on Moore’s bid price if not his projection in the Guide. The Guide projections and price update is due tomorrow, probably in the evening, here on the corrections page. It will have hugely reworked projections and bid prices for those who bought the Guide. 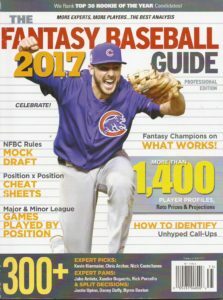 You may still find it on the shelves at Barnes and Noble and other magazine retailers, and you can also buy the online version at thefantasysportsguide.com. Use the promo code Rotoman17 and get $1 off. As to the issue of team names, they are available in the stat lines for all the players with major league experience last year. And I do add team names to the end of the prospect capsules because readers very much want them, but it really is a problem to be more definitive. The magazine heads off to the printer just days after the Winter Meetings conclude, and at that point there are still hundreds of free agents out there. Plus, trades will be made. So, the choices are to either list the team name that the player ended last year with, which in hundreds of cases will be wrong, or their team name at press time, which means hundreds will be listed as a Free Agent. It’s always seemed to me that the team name in the stats is just as reliable as either of the above methods, and doesn’t pretend to an authority that we don’t have in mid December. I’m open to suggestions, surely, so please feel free to send them along. A reader named Jeffrey reports: I figure that if Tyler Anderson and Jon Gray are worth $2 apiece, then Tyler Chatwood should be worth a bid of $1. If I see anything else of note, I will send another email. It’s Out! 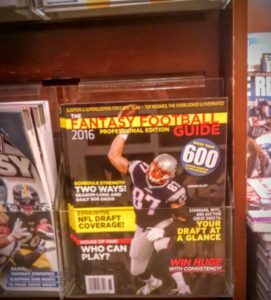 The Fantasy Football Guide 2016! 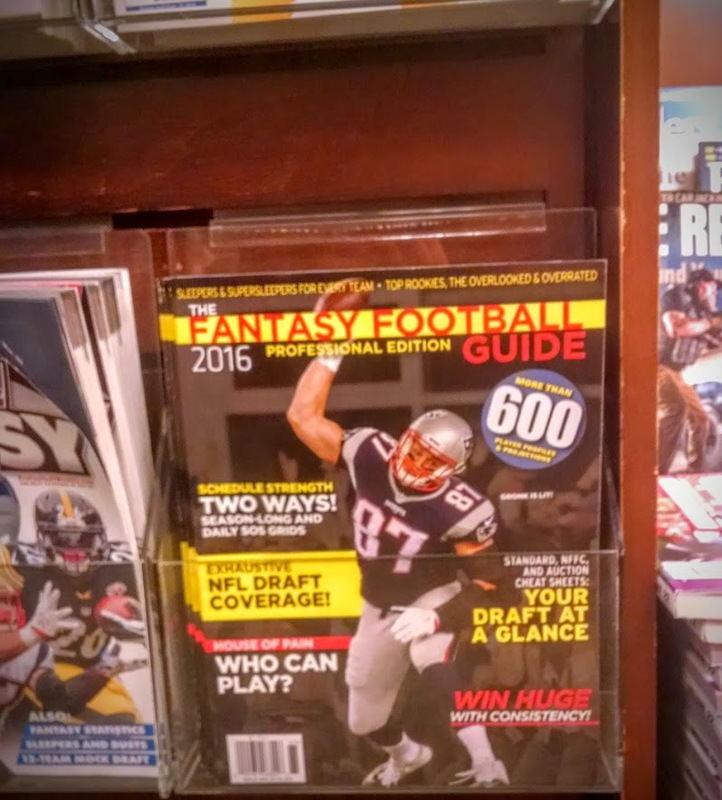 Here it is, the 17th annual Fantasy Football Guide. It’s in stores now. That picture is from a Barnes and Noble in Brooklyn NY, where it appeared for the first time yesterday. We’re usually found in Barnes and Noble and Wal Mart (though not in Wal Mart Canada), and each year I find it for sale in different grocery and drug stores. 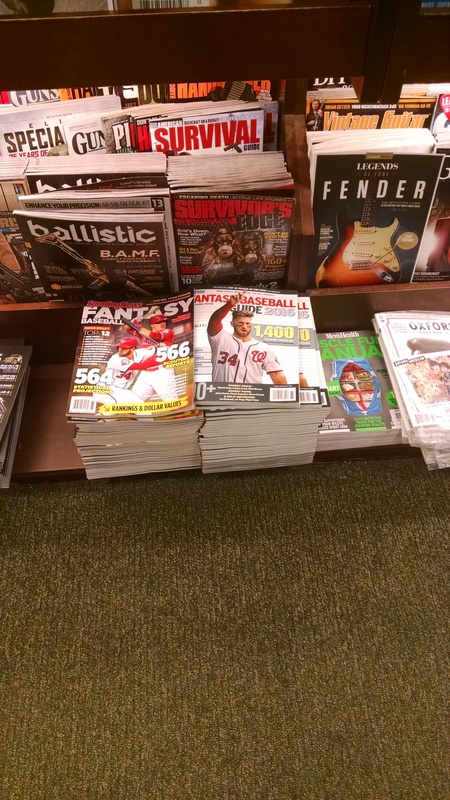 I found the Fantasy Baseball Guide 2016 in my local CVS last March, but when I went back a few days later they had moved the magazines to the back corner of the store. Yesterday, I went in and the magazine display was smaller and had no sports magazines at all. I know where not to go. Andy Goldstein edited the position pages, which he wrote along with JD Bolick, David Gonos, HC Green, Marc Meltzer, and Matt Wilson. Herija C. Green edited the team pages, and wrote some of them, along with Matt Wilson, Rob Blackstien, Buck Davidson, Jack Delaney, Daniel Dobish, Keith Hernandez, Jason Hoffman, and Nick Minnix. JD Bolick’s NFL Draft review runs 10 dense pages, with a ton of video references if you’re interested in see what he’s describing. Doug Anderson and Dave Gawron prepared Strength of Schedule info for Daily and Full Season games respectively. Bob Lung contributed a piece about why consistent play can help you put together a better team. John LaPresto surveys the wounded and the walking, and lets us know how things are looking for the injured. Marc Meltzer prepared our player projections. And Lawr Michael and Geoff Stein put together the Mock Draft, which features both friends and new faces this year. I hope you enjoy it. Let me know if you find any errors or what you think by writing to askrotoman at gmail.com. There’s a link to a corrections page at the top of this page. And if you can’t find a physical copy, there will soon be online and pdf versions available at thefantasysportsguide.com. Use the coupon code ROTOMAN and save $1 off your online purchase. 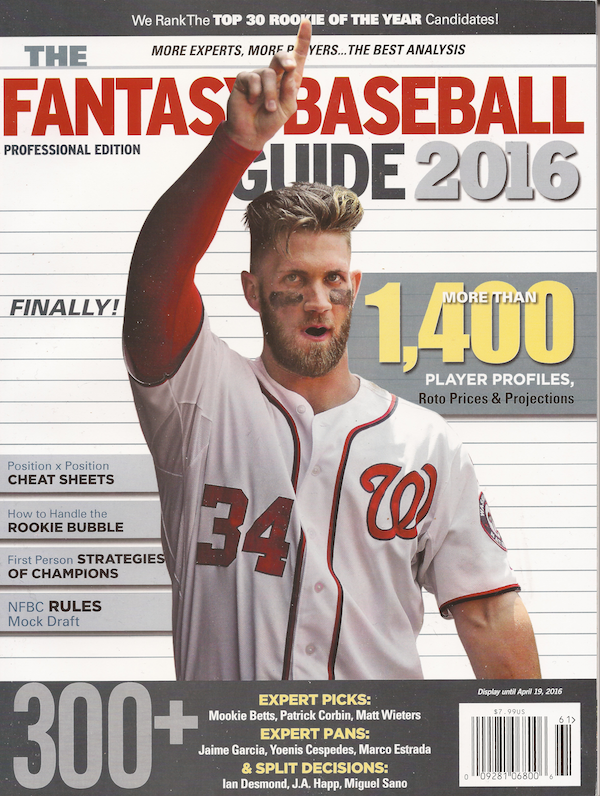 Updated Projections for Fantasy Baseball Guide 2016 Buyers, out now! Slip over to the Corrections and Updates page for the 2016 Fantasy Baseball Guide for an Excel spreadsheet with updated projections and Big Prices. The update is for FBG buyers only. The password is the lower case version of the last name of the only $14 player on page 66 of this year’s Guide. You can look it up! 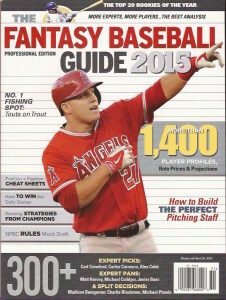 How did Joe Panik not get drafted in your mock draft in the Guide? Shocking, isn’t it? I have a few ideas, which may be of interest to those who follow mock and industry drafts. When you draft in November, there are no rankings. So the draft software (couchmanagers.com, thank you very much) throws up a list based off of who knows what. This doesn’t much matter early, when everyone is working off their own lists, but in the frenzy and late night (of all our souls) it is human nature to lean on the list in the endgame. Panik must have been ranked down the list after missing two months, and was overlooked. He’s just not ranked that highly. In last night’s Tout Wars Mixed Draft, he was taken in the 20th round. With the last pick in the 20th round. That’s number 300 overall. I think we may be undervaluing the power surge he showed before he was hurt last year, but that placement has been pretty consistent. If he hits 12-15 homers and .300+ someone (in this case Rudy Gamble) is going to be very happy. Not many 2B were taken in the endgame. Scarcity means those who are taken are taken earlier, and makes it easier for someone to slip through. In the last three rounds of the mock, after Panik’s place in Tout, the only second basemen taken were Micah Johnson and Jurrickson Profar. I spied the Guide in the wild today, at the Park Slope Barnes and Noble. Just us and the Sporting News amidst the gun mags. 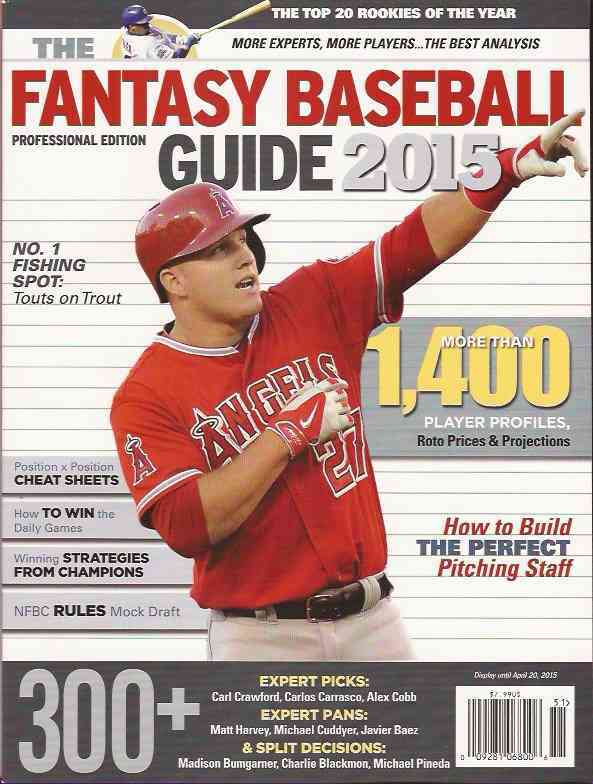 David Gonos Likes The Fantasy Baseball Guide! I just found this review of the Fantasy Baseball Guide on David Gonos’s website. David is a friend and colleague, and also a good guy. He’s also a straight shooter and a knowledgeable fantasy writer, which is why his praise here means so much to me. He also does a good in-depth job of describing the Guide’s contents. 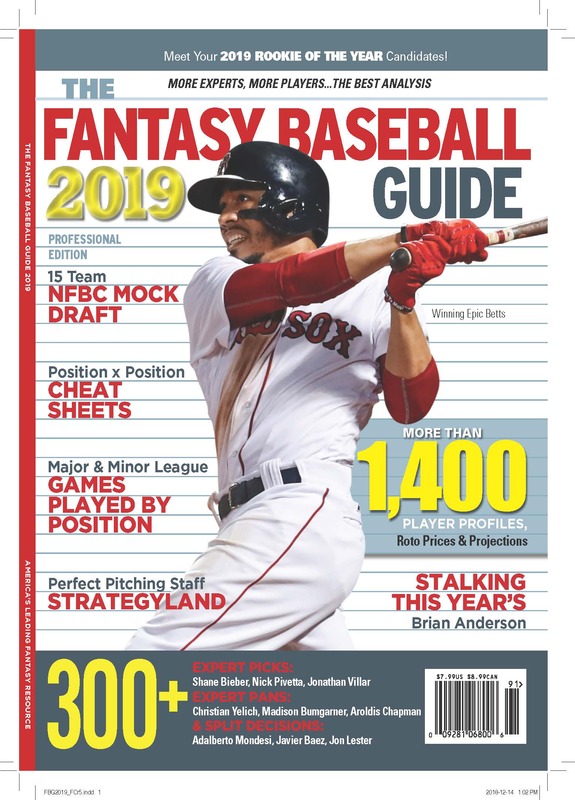 The magazine has been out for almost six weeks now, which means it is selling out in some outlets (Barnes and Noble, Walmart, and other drug, book and grocery stores), but use David’s promo code (gonos15) and save a buck at thefantasysportsguide.com on the digital version.